This lovely four-star hotel is located only 150 meters (450 ft) from Ornos Beach and features 49 guest rooms and suites. The hotel was built in 1999 and was recently renovated. Its architecture is Cycladic throughout, and interior furnishings and color schemes are very Mykonian. Comfortable public spaces and lovely guest rooms create a very relaxed atmosphere, and the hotel has excellent services and facilities. The swimming pool area has a lovely sun terrace with wicker lounges. Guest rooms and suites are very spacious and are decorated in soft tones. 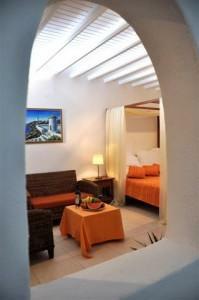 Each room has its own balcony or terrace, plus private bath with shower, some with bathtub, and all with hairdryer. Amenities include individual climate control, satellite color television, Wi-Fi Internet access, mini fridge, in-room safe box, and direct-dial telephone. Non-smoking rooms are available, as are rooms for the disabled. The larger rooms/suites can accommodate up to four persons, and some have Jacuzzi. Although in the Ornos area there is a full range of services covering all the needs of guests, there is also frequent public bus connection with Mykonos town which, in midsummer, goes on until late at night. Also, there is direct boat connection between Ornos Beach and Delos island with its archaeological site.